How are leaf shapes generated? My research at MPI in Miltos Tsiantis Department focuses mostly on the understanding of leaf morphogenesis. All leaves initiate at the shoot apical meristem as small primordium. It is unclear how such a simple structure can generate a wide variety of leaf shapes found in nature. In the lab, we use two closely related species from Brassicaceae family as model systems: Arabidopsis thaliana, which has simple leaves, and Cardamine hirsuta, which has dissected leaves with individual leaflets. To understand leaves development I have implemented a new method to follow the growth of the primordia over several days. This confocal based time-lapse method, when combined with 3D image analysis software MorphoGraphX enables extracting growth data at the cellular resolution of organs with very complicated shapes. This methodology was successfully applied to uncover the role of RCO gene in leaf shape diversification. RCO is required for the compound leaf development in Cardamine. RCO action is independent of auxin-based patterning. Instate we have shown that RCO shapes C. hirsuta leaves by locally repressing growth at the flanks of initiating leaflets. The potential of RCO to repress growth is conserved in Arabidopsis. 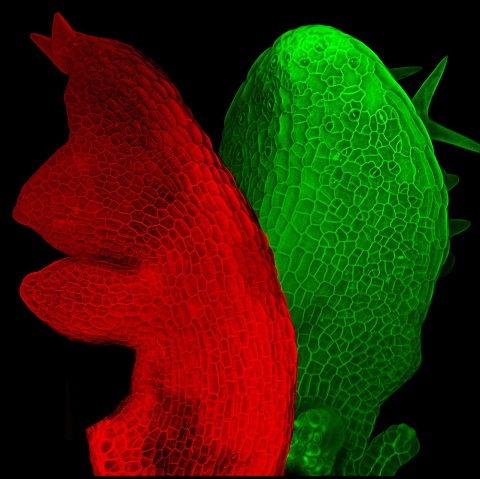 The time-lapse procedure is now applied to assess the role of other genes in leaf development. This approach, when combined with gene expression analysis and computational modeling, holds promise to uncover the mechanisms underlying leaf shape diversification. Xenarios I., Kuhlemeier C., & Smith R.S. eLife 4, e05864 (2015) Reprint. Smith R.S., Huijser P., Bailey C.D., & Tsiantis M.
Science 343, 780-783 (2014) Reprint.